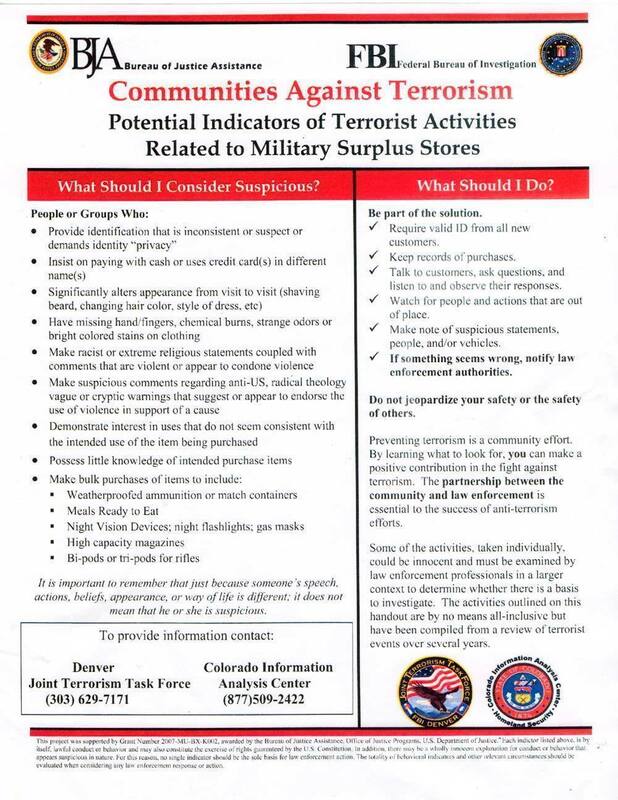 The FBI has begun a program to monitor people who shop at military surplus stores, calling them “terrorists”and trying to convince surplus store personnel to spy on their customers for the government. The brochure below “Potential Indicators of Terrorist Activities Related to Military Surplus Stores” describes the program to the surplus store personnel. Store personnel are told that people who “demand identity privacy”or ‘”insist on paying with cash” are suspicious and may be terrorists. Personally, this motivates me even more to always pay with cash so that the government has more difficulty profiling me as a terrorist. This brochure seems to imply that buying survival gear with a credit card could result in a FBI raid on my home. If paying with cash can help prevent a FBI raid on my home, it seems like a good idea to me. Weatherproof ammunition containers, also known as “ammo cans” are used for long-term storage of all sorts of gear — including both ammunition and food. Meals Ready to Eat (MRE’s) are food packets which are designed for long term storage. Is the government really worried about people who are storing food? Or really, as that is now proven, why is the government worried about people storing food? Why would the government not want us to have food? I don’t mean to be paranoid, but that strikes me as very worrisome. Why does the government worry about “night flashlights”? What use is a flashlight during the day? What terrorist attacks have been made using flashlights? Does it really seem that the purpose of this program is to identify and track terrorists, as claimed? Doesn’t it seem that this program is more targeted towards survivalists — towards anyone who is actively working to make themselves less dependent upon the government? 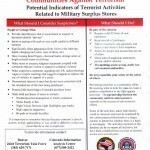 The government also uses this brochure to continue their mindless was against “high capacity magazines.” “Low capacity magazines” are useless for almost all purposes. Should we all replace the gas tanks in our cars with “low capacity gas tanks” to make the government feel better? Perhaps we should live in “low capacity houses” too? Why would the government be so afraid of efficiency?